* Alfie Boe belts out a number during his Eisteddfod concert. 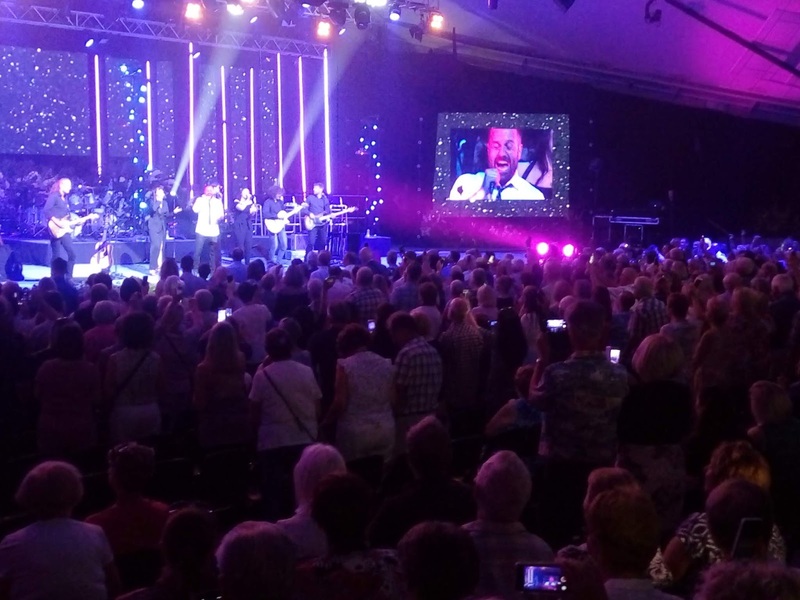 Alfie Boe declared towards the finale of his smash-hit concert at the Eisteddfod last night (Tuesday) that it was the “best gig of my life”. However, he admitted that his judgment had been slightly coloured by England’s World Cup victory over Colombia of which he was loudly informed by a member of the audience who’d been watching the match on his phone. Not that the international singing star hadn’t been keeping in touch with developments in Russia himself – throughout the sell-out concert he’d been taking quick glances at a monitor at the front of the stage rigged up to show the action solely to him at the flip of a lid. The performance of over two hours set off at a cracking page as Boe leapt onto the stage to belt out two pulsing jazzy numbers from his latest album, Swing Swing and Best of All I’ve Got My Baby. Perhaps not something his more traditional fans expected but then he did explain at a number of points that he likes to dart from musical style to style. And that he did throughout the night, with more red hot jazz, country and plain hard rock all on liberal offer. Not to disappoint the traditionalists there was a moving presentation of the number from Les Mis that helped make him famous, Bring Him Home, which prompted a partial standing ovation. * Boe gets a standing ovation from the sell-out crowd. Next up came a collection of the Italian material which also helped make his name. In the line-up had to be Volare one note of which he delivered so strongly that it almost bored into your soul. It was during this number that he learned England had scored their first goal, which sent him hopping about the stage with glee and gave fresh impetus – if any were needed – to his delivery of Mambo Italiano. As he turned his attention to country-style songs there was another memorable moment as Boe encouraged Eisteddfod president Terry Waite, sitting as always in the front row, to stand up and help him with the intro of one number, and this the old peacemaker did with perhaps surprising aplomb and gusto. Later the star stopped another song to request that a pen be brought out to him so he could have Terry sign his guitar – telling the audience he’d have it up on an E-bay later. 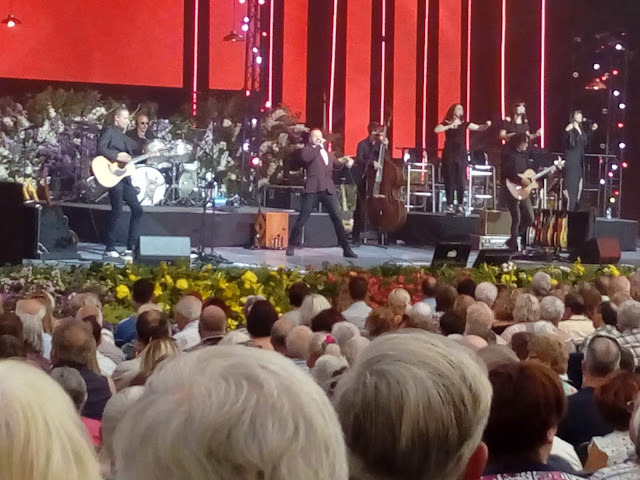 There was another switch of style as he presented a couple of powerful songs, including the thumping A Thousand Years, from the award-winning album he did not long ago with fellow singing legend Michael Ball. Working with Ball, he told us, had been his personal contribution to Help the Aged. Numbers from his new solo album came flowing out like rich wine just before the cry went out from the watcher in the crowd that England had beaten down the Colombians on penalties to reach the World Cup quarter finals. As a result things went a bit wild both on stage and in the jam-packed auditorium as Boe and his excellent 10-piece band plus three backing singers cannoned out a couple of old The Who numbers from Quadraphenia. After that it all became a bit of a blur as that sledgehammer of a voice slammed out more and more of the good stuff. Just when you thought he didn’t have anything left to give he jumped down from the stage and embarked on a couple of laps of honour through the cheering crowd, sort of taking part in his own standing ovation. This is a man who gives value for money.